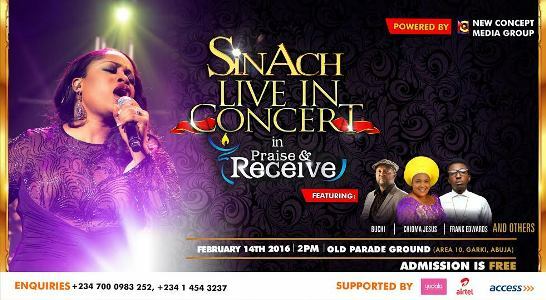 Celebrate Valentine’s Day in grand style with that special person in your life or with friends, family and loved ones as Sinach Live in Concert hits the beautiful city of Abuja, with Nigeria’s foremost female Praise and Worship Leader – Sinach. Scheduled for Sunday, 14th February, 2015 at the Old Parade Ground, Area 10, Garki, Abuja from 2: 00p.m, this praise and worship explosion is the first in a series of a Nationwide Gospel Concert Tour tagged – Praise & Receive. Also billed to thrill the audience on Valentine’s Day is a host of top gospel headliners including FRANK EDWARD, gospel reggae crooner- BUCHI and indigenous languages gospel ambassador –CHIOMA JESUS, among several other acts lined up. It promises to be a great time of Energetic Praise, Heaven Rending Worship, Blessings Outpouring, Entertaining Fun, Laughter and much more, with powerful acoustics and sound from NCMG’s state-of-the-art digital musical equipment which will be unveiled in full force at the concert venue.